These Paleo Lemon Blueberry Muffins are a healthy treat perfect for summertime. They are made gluten-free, dairy-free and pack a nutritious punch! Does the combination of blueberry and lemon remind anyone else of summer or is it just me? I mean I could probably eat them year round, but I literally jumped at the chance to make these when the weather started to warm up. Growing up, my mom used to always buy me lemon poppyseed muffins from our bakery and I would mash melted blueberries on top to make this combo – too good to be true! There are so many different breads and cakes now-a-days that are lemon blueberry flavored, and I’m always so excited to try them because they are always SO fresh and light. I especially love it if there is some sort of glaze on top…lemon and glaze just go together. 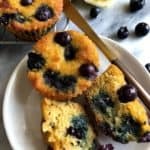 If you’re looking for a summertime muffin to make that your whole family will love and is slightly healthier than original muffins, give these a try! They didn’t last long in our house at all. 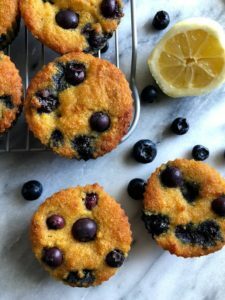 Paleo Lemon Blueberry Muffins perfect for a healthy summertime treat! Preheat oven to 350F and prepare muffin tin, I used silicone molds. In a large bowl, whisk together eggs, honey, vanilla, coconut oil, lemon juice, and lemon zest. Whisk dry into wet. Do not over-mix. Fold in blueberries and scoop into liners. Bake for 24-26 minutes or until toothpick comes out clean. would applesauce be a good replacement for coconut oil? 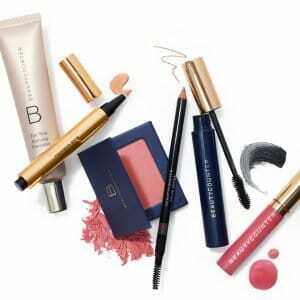 I’ve never tried it – but you definitely could!